Percocet is a rapid onset analgesic. But what effects does it produce to the body? How is Percocet metabolized? 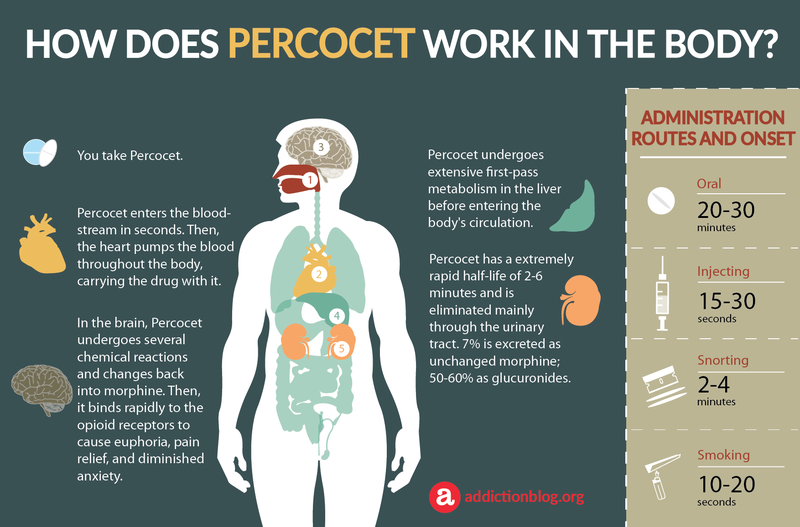 Find out the specific effects Percocet has on each organ of the body in this infographic. Percocet affect the brain. As opposed to local painkillers that work directly on the parts of your body where you feel pain, oxycodone binds to opiate receptors in the central nervous system to provide pain relief. This creates an analgesic and euphoric effect. However, as a result, the drug can be habit-forming. This is why pharma companies have added acetaminophen as the second active ingredient found in Percocet. Acetaminophen is an analgesic and antipyretics. This combination attempts to make Percocet more safet, because acetaminophen has a daily dose limit. What ends up happening, though, is that Percocet REMAINS a strongly addictive painkiller with severe long term damages to the brain and body. In this Percocet infographic, we visually present how Percocet travels through the body after you take it. We look at basic metabolism and describe the process in several visual description. We welcome you to post any questions regarding Percocet effects at the end, in the comments section reserved for questions. We value your questions and try to answer them as soon as we can. 1. YOU TAKE PERCOCET: Percocet can be used: orally, intranasally, intravenously, or by inhalation. 2. STOMACH: Percocet starts producing its effects 15 minutes after oral administration and reaches its peak for 30-60 minutes. The high from Percocet is similar to the one from heroin. This high creates an overall feeling of euphoria, claim, relaxation and intense pleasure. When Percocet is taken orally, it may cause upset stomach as a side effect. 3. NOSE: Snorting Percocet intensifies the effect of the drug, transferring large amounts of the drug to instantly enter the bloodstream through the nose. The high from snorting Percocet is felt 2-4 minutes. 4. LUNGS: Smoking Percocet is very dangerous and can easily lead to overdose since it delivers the drug to your lungs almost immediately as you inhale. 5. HEART: Percocet affects heart rate and may cause slow or fast heartbeats. Even when taken orally Percocet may affect your blood pressure and lead to either increase or decrease levels of blood pressure. Percocet hits its peak blood plasma levels very quickly. Peak effects of Percocet are felt 30-60 minutes after you take it. 7. LIVER: Acetaminophen is largely converted to nontoxic glucuronate or sulfate conjugates and secreted in the urine. Oxycodone is metabolized by the enzymes CYP3A4 and CYP2D6, and its clearance therefore can be altered by inhibitors and inducers of these enzymes. How fast Percocet will be metabolized depends on your weight, the food you’ve eaten before taking Percocet and the way you administer Percocet. 8. KIDNEYS: Oxycodone and its metabolites are excreted primarily via the kidney. Percocet is eliminated from the body through urine in about 2 hours after you take it. The total plasma clearance was approximately 1.4 L/min in adults. Percocet 2.5 mg/325 mg = 1 or 2 tablets every 6 hours as needed for pain. Percocet 5 mg/325 mg = 1 tablet every 6 hours as needed for pain. Percocet 7.5 mg/325 mg = 1 tablet every 6 hours as needed for pain. Percocet T 10 mg/325 mg = 1 tablet every 6 hours as needed for pain. Percocet In The Body Questions? Hopefully, we’ve given you a good idea about metabolism of Percocet. However, if you have any additional questions, please post them in the designated section at the end of the page. We look forward to answering any and all of your questions personally and promptly.